This entry was posted on July 16, 2016 at 3:42 pm and is filed under 9/11, New York City, poetry, Uncategorized. You can subscribe via RSS 2.0 feed to this post's comments. Congratulations on Dogspell…I love that title!! Excellent, K and thank you for the challenge! Thank you, Hannah. Really enjoyed your typewriter poem! k.
The pacing of the last two stanzas is so perfect for the mood. I felt like I was losing my breath as I read, and I could feel her why her mind was on her knees. And best of luck with Dogspell. Thanks so much, Magaly. k.
What an intensety in the search, and that release when found. Having lost someone and find again, that sense must be one to return many many times. A person who has not been in the situation of a war zone, be it battle field or cityscape, cannot fully know the terror of looking for a loved one. The sights on the street in Nice brought me to tears for the suffering of the survivors (aren’t we all who have lived to see it?) And I feel a sense of dread, waking to each day, wondering what is to come next. Your poem, places me right into the scene, stark, terrifying. Wasn’t Hermes, lord of roads, also the god of the lucky deal? There’s something magical in that boon, the coin’s flip coming down our way, the deal of the century, the motherlode, the Grail, achieved when we find that thing half-buried in dust, pull it free, and convince the seller it’s worth only what it looks like … or, to walk away from that found thing because its just too much, because we just don’t need it, only to wake in the middle of the night pierced by the recognition that it was EXACTLY what we needed or wanted most, perhaps because we turned our back on fate. I should know, I’ve watched my wife … Anyhoom, all of the transactional analysis is there in your poem, where the art of the deal is the art of the poem. To find it, grasp the lysis, hold it for a second as you do here, what else can we do but whisper “thanks”? And thanks for the challenge, and congrats on your latest book. It’s amazing you keep up such a full life and continue knocking ’em out. Ha. Thanks, Brendan. The last books have been rather old manuscripts that I’ve finally just “finished” as it were, the main writing have been done some time ago. Thanks for kind comment and your wonderful poem. k.
Love is a constant bargaining with fate, especially parental love, though of course this doesn’t have to apply merely to that, but it has that intensity for me that only comes from responsibility as well as love. Very real and immediate, k–an agile and strong piece. I especially like the promises shrugged off like a shawl and forgotten. Congrats on your book, Karin. Any book with dogs in it has my vote!!!!! 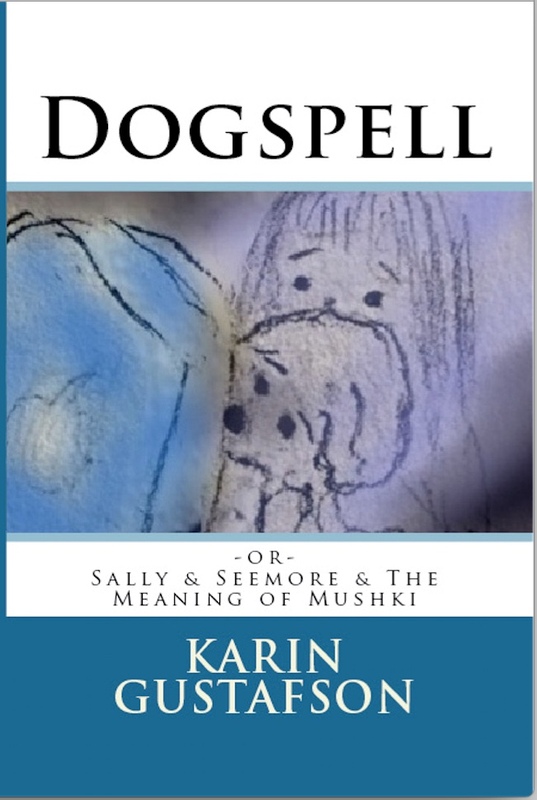 “Dogspell” ~~ great title for what I’m certain is a great book! During a visit to the 9/11 Memorial Museum last summer I stood in the room with the thousands of photos and wept. I cannot imagine losing a loved one, a friend, a stranger to that kind of violence. And it continues. Thanks for kind words re book, Helen. It is a sweet book, I think. k.
I like this, K, I like NYC (was there May 31 this year). I remember the village two ways. First was the leisurely walk up from Battery Park to the Union Station. I stopped and enjoyed and dilly-dallied things and areas more than Mrs. Jim and Karen. I also would get out of breath so I slowed and smelled some daisies. The next Monday my cardiologist would have me in for what turned out to be another stent implant. The wept and whispered thanks in this was what made me stop for breath. It was needed, and I felt a peace in this — memories of beauty that will not fade even with the violence we won’t forget. That is beautiful as is the whole poem. A draft? I don’t think so. Polly, you are so very kind. Thank you! K.